Only a couple of weeks ago, Manchester City was contemplating another Premier league title secured in the very last round, as the points separating them from local rivals were not intimidated. Everything changed meanwhile and now they have a 15 point gap to close, with the odds of accomplishing something like this being insignificant. Although the Premier League title has slipped through their fingers, today’s visitors have plenty of reasons to treat the game against Aston Villa seriously. Tottenham and Chelsea are encroaching on their Champions League title and the last thing Manchester City needs is to go through qualifying rounds. They have plenty of time to avoid this scenario and a significant advantage to build on, but first they need to and their recent slip. Two consecutive victories over Leeds and Chelsea should have strengthened their morale as Manchester City scored six goals without conceding one. They will have a difficult mission in replicating that performance away at Birmingham, where Aston Villa is playing some offensive football and has nothing to lose. The hosts have already crossed the terrible threshold and are now tied with Wigan for the 17th place and their 24 points are not enough to take them out of the relegation zone. A narrow margin victory over Manchester City or even a draw would do that, but losing consecutive games after their recent defeat to Arsenal would only aggravate their misery. The hosts miss three players who would usually feature in the defensive or midfield, but their offensive is at full strength and this is refreshing. Manchester City coach Mancini can finally field his best starting team, as he has no absentees and no reasons to rest the players for upcoming games. Aguero, Dzeko and Tevez with all play tonight and they have scored a combined 29 goals, which makes them a real threat for the shaky Aston Villa defense. One thing that punters should be aware of is that the hosts are not going to respond by lining up a defensive minded team, but instead will once again start with three strikers. Benteke is the top scorer, but young Weimann has scored in each of the last two games and will feature upfront alongside Agbonlahor. 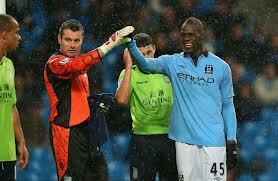 While they are no match for the offensive trio sent forward by Mancini, they will give City a run for its money. The odds for more than 2.5 goals to be scored are not spectacular, but they are still far better than a straight away victory, which makes them the best choice for punters.